While riding in the passenger seat this week, I snapped these photos of the hills and sky, near Fallbrook. The bottom shot also shows the reflection of the interior of Bob's car. Click on the link's above each photo, to visit these great meme's. 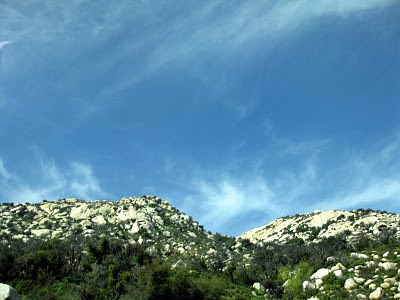 beautiful rocky hillsides . My husband says all my landmarks are food related and he may be right. These photos make me think of Nessie Burger! I love your landscape out there Jan. The reflection is really cool. Nice Jan...I love your reflection shot how cool. 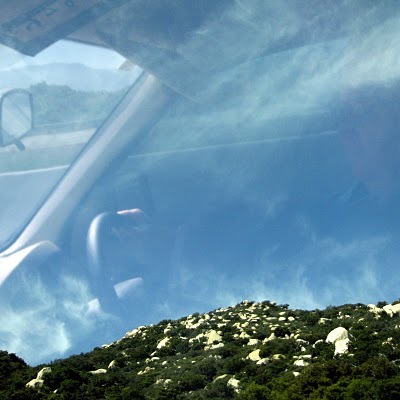 There is a lot of beauty above those rolling hills, Jan. And you captured a wonderful reflection of your husband on the wheel. Those two photos complement each other so nicely!!! Great pictures. I guess the reflection shot was taken through a window. Nice. Cool reflection! When were you in California? I recognized these rocks in a heartbeat! Oh...so sorry...I thought this was Carly's post! oops! Disregard the "California" comment and just know that I still think the reflection is SO cool! I love the beautiful mountains and the sky. Great reflection. I really like the reflection. Great abstraction.